Dhyan, THANK YOU so much for your comment. I could tell from just looking at the fabric that she must have spent ages on it. I’ll try to post a wider shot showing more of her work. The needle just made me feel close to her in a strange way. Amazing. I think this is a form of Hardanger embroidery (google it for examples). 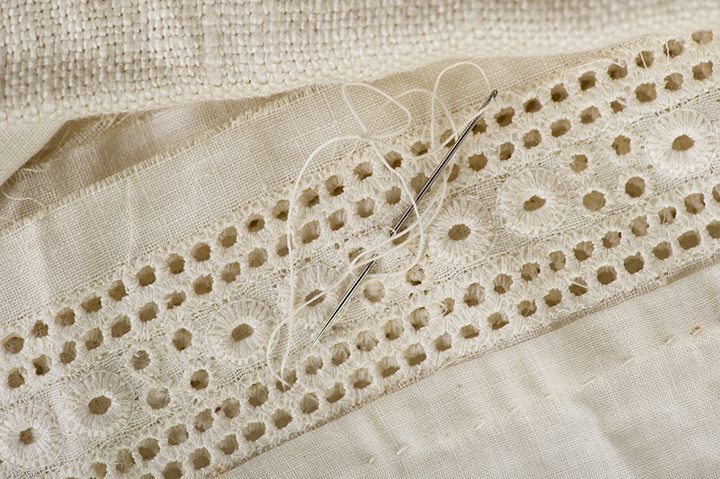 As I understand it the hole is not cut but formed by pulling the embroidery threads tightly enough to create an opening in the woven fabric around an intersection of two pair of cross threads. This example is fantastic. Hi Jon, I have a mental illness (paranoid schizophrenia) and have always been interested in the history of psychiatry. Thank you so much for photographing these people’s history and giving us a glimpse into their personal lives. I am absolutely amazed by the suitcases. The above needlework from Margaret could also be hemstiching (Hohlsaumstickerei) and not cutwork (Durchbrucharbeit, I hope my translation programme translated this well from German to Englisch and back to German), as one would never really cut into such a piece of clothing. I still have bed linen from my swiss grandmother (born 1899) with almost similar patterns. Not surprisingly, they just had more time doing handicrafts, as there was no television, maybe not even radio, and certainly no internet and cell phones………….. and I am sure they did not Clorox. In those times, they put the linen on the lawn outside and let the sun do the work.